Did you know that 35% of your home's heat loss is caused by air leaks? The majority of heat loss isn't through ceilings (10%), walls (12-14%) or floors (15-18%), but through air leaks around doors and windows. There are ways to insulate doors and create air-tight windows. What's the best way to protect your air conditioning unit and keep the heat inside your home this winter? Most get ready for winter by adding insulation to crawlspaces and basements, but there are more effective and efficient ways to prepare your home for winter. Reduce air leaks around plumbing vents, electrical outlets, attic doors, plumbing and other openings to the outdoors. Frost King shows you how to install foam tape insulation around doors, windows and pipes. But how do you ensure that your air conditioner is leakproof and protected from the elements? Besides unplugging the AC, cleaning the filter and installing weatherstripping around the window frame, there's one more way to prepare for winter with Frost King's air conditioner covers. Our assortment of air conditioner covers protect AC units and prevent air leaks, which help you conserve energy and save money on your heating bill throughout those cold winter months. Window air conditioning covers are elasticized to fit around most window units. Covers for outside use protect the AC from harsh winter weather, such as accumulating snow and ice. 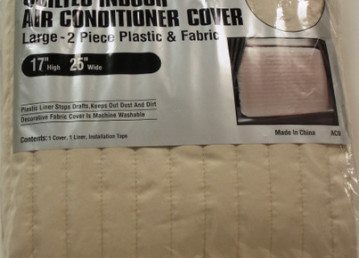 2-piece quilted indoor air conditioner cover provides an extra layer of protection and insulation. Don't forget that Frost King has an outdoor cover for central air conditioners, as well. Plus Frost King also carries a range of window AC accessories to help you maintain and insulate the unit. As always, if you have questions about installing and using air conditioner covers or any of our other DIY home improvement products, view our FAQs, call 1-800-299-5700 or send us a note.